I'm pretty embarrassed by how delinquent I've been in blogging. What with the schedule of school/husband's work/daycare, things are always in a mild state of chaos at home. On top of it all, my mother was in town and my dad came in yesterday for a few days, as Baby Boots caught a bad cold from daycare and everyone's pitching in to help while my husband is busy at work and I'm busy writing grades and comments (second long weekend of the year!). Anyway, hasn't been conducive to me taking pictures of my - admittedly - AWESOME outfits. That's the irony of it all: I've been really feeling my outfits lately - and have some even MORE new threads to show off - but what with being remiss in taking photos...alas. Oh, and I haven't been reading anyone. I've barely been ON the internet. I'm just horrible. I thought about giving up blogging a few times, but I would miss it too much. I'm hoping to get back in the swing of things ... soon. I don't know when. Perhaps when Baby Boots isn't hacking so much? I stress eat. A lot. I was losing baby weight, but I think I undid all the good work with gluten-free cookies bought yesterday. I could look of pictures of glasses all. Day. Long. Etsy and I are becoming BFFs. I enjoy looking at pictures of boots on the internet. I've had a hidden fascination with cowboy boots for about 10 years due to my high school best friend, who would ROCK her cowboy boots with a cute skirt [hi, Sido!]. And over the weekend, there was a giveaway and I saw that there were turquoise cowboy boots with fleur de lis embroidery (on the back) and I have a $10 coupon and shipping is free and...I can't stop thinking about them. Style Nation, what say you? Should these be my twelfth pair of boots? 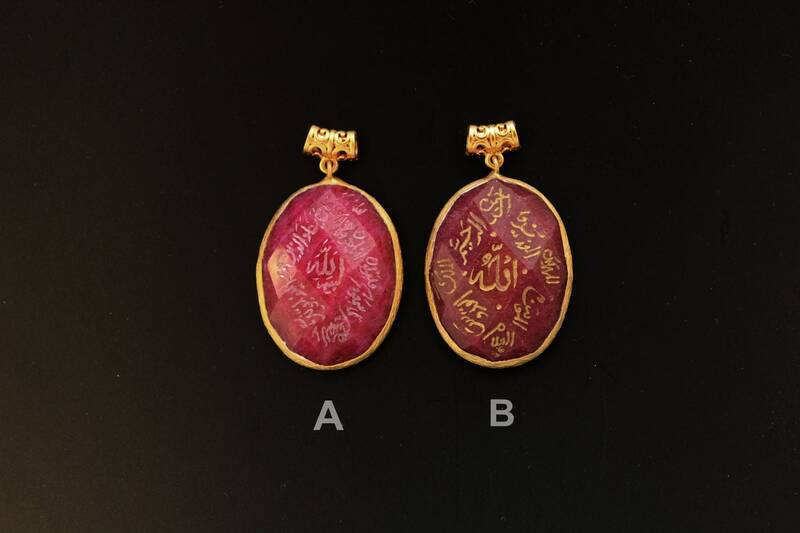 I really want to get one of these beautiful pendants with the Arabic carved onto them - the stone is supposedly ruby! But which one? I kind of like A because it's so subtle, but B is so striking... What opinions do you have on these? In other news, I have mysteriously acquired $200 worth of credit toward a fancy optician in the Boston area. And I'm planning to basically go nuts. I love my current Prada glasses, but I think now that I basically got this gift dropped into my lap (since - as much as I'd like to buy all the things I'm featuring - I don't really have extra money to spend on things, I'm planning to ask my parents for the difference as a Christmas present), I'm gonna go nuts. I'll try on my fantasy glasses and, if those don't work out, will just go crazy for amazing frames. In other news... I'm thinking a lot about my future. I don't want to share too much, but let's say that I'm starting to sniff out bigger and better things. We'll see what happens. So that's what's been up with me. How about y'all? Oh no! Hope Baby Boots is feeling better soon. Good to see you popping in, though :) I have to say that I do love the color of those boots. I can see why you are having trouble resisting! I am enthralled with the turquoise color! Me, I'd worry that the embroidery would make the boots much harder to style . . . if only they made those boots with removable fleurs-de-lys, I'd snap 'em up myself. When my daughter was a baby and had her first cold, I remember sitting there sucking gunk out of her nose with a bulb syringe and thinking, "Of all the things I never thought I'd find myself doing . . ." Now, when the taller-than-I-am sixteen-year-old is being a typical snotty (pun intended) teenager, I sometimes keep my good humor by saying to myself silently, "Ah yes, be like that. But I remember when I had to suction gunk out of your nose!"